Hello and thanks for taking the time to look at my portfolio, my name is Ed and I make games. Below are the projects I have worked on and a summary of my contributions. If you want more info on my work on a project you can visit its page for more details. Work Summary: As an intern, my contributions to Marvel Heroes came through in polish and refinement of content prior to and after the console launch. I dove deep into each system and tool, learning everything my team had to share. Among other things, I improved enemy population distribution and generation throughout multiple zones and instances, refined and improved Legendary Quests, and developed a new game mode scenario from scratch. The Game: Guardian of the Gears is a puzzle adventure where you take control of an interactive clockwork environment to navigate the fragmented landscape and repair what has been broken! Work Summary: I have taken ownership of multiple levels in Unreal Engine 4, taking them from concept and white-boxing to playtesting and iteration. I am developing puzzles within these levels, using a moving clockwork environment to create wonder and challenge. I am currently working with artists to bring levels to final polish. In addition, I am implementing camera features which will help with player guidance and overall product quality. The Game: Among the Clouds is a two player asymmetric competitive game that takes place on board an airship. One player is a robot trying to escape the facility while the other player is the security system trying to identify and capture them. Work Summary: I designed, implemented, playtested, and polished the level from beginning to end and created the on-rails camera to create a fluctuation in power between the two players which created a fun back and forth competition. I also worked with our artists on art implementation and presentation. In pre-production I created multiple prototypes in Unity which resulted in a clear vision for a fun game with an achievable scope. The Game: Showdown is a two-player futuristic arena sports game featuring 5 unique athletes. Work Summary: I developed showdown in Unreal Engine 4 as a solo project. I programmed an A* pathfinding system in C++ inside of UE4 and then utilized it in gameplay systems. User experience was a challenge that I worked to overcome by designing the game’s user interface and interactions. I designed and iterated on the game as an analog board game for efficiency and then used that proven design to save time on digital development. The Game: OmniArch is a 2D sidescrolling action game where you play as a rebel taking down a rogue AI government. Fight your way through the city as you take down a robot police force in an action packed adventure. Work Summary: I took ownership of the level design, focusing on creating a well paced and action packed experience by designing combat encounters and special events. Built, tested, and polished player controller, combat, and enemies to work in harmony with one another to deliver an exciting game. The Game: Game School Simulator 2015 is a casual 2D simulation game where players take the role of headmaster of a brand new game school. Work Summary: Designed the gameplay systems including rooms, admissions, and resources to deliver on the fantasy of being the headmaster of your own school. Implemented the construction mechanics in C.
RGB The Game is an exciting iOS game, where you dodge countless obstacles, smash through walls, and collect orbs to purchase upgrades in your future adventures! 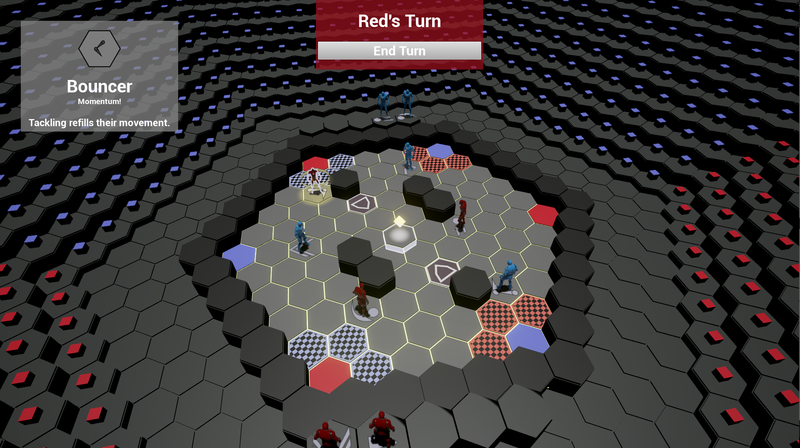 5 Star Showdown is a 2 player futuristic arena sport board game featuring 5 unique athletes.